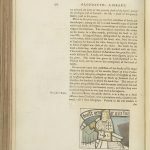 In my previous post I mentioned the usefulness of the extra-illustrated volumes for what they could tell us about medieval visual culture extant in the late eighteenth century. 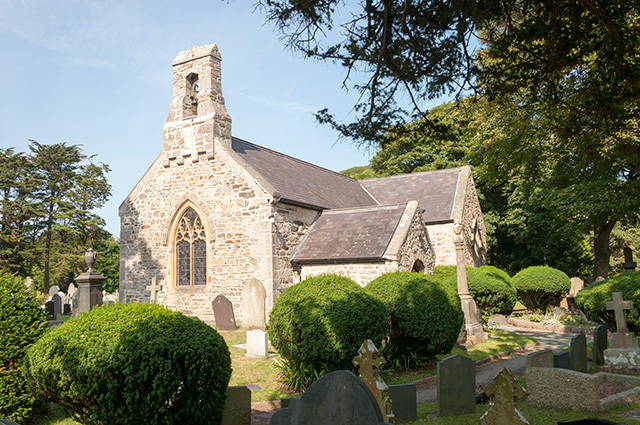 Church of St Eleri and St Mary, Llanrhos. 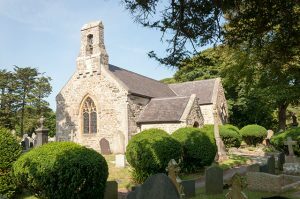 One example of this is the series of illustrations of the donor figure in stained glass at Eglwys Rhos: the Church of St Eleri and St Mary, Llanrhos, near Conwy. 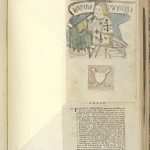 It is illustrated in volume four of the National Library of Wales’ collection of extra-illustrated tours, and Pennant identifies him in the text as Howel ap Tudor of Mostyn, the donor of the window (p. 328), dating the window to the fifteenth century. 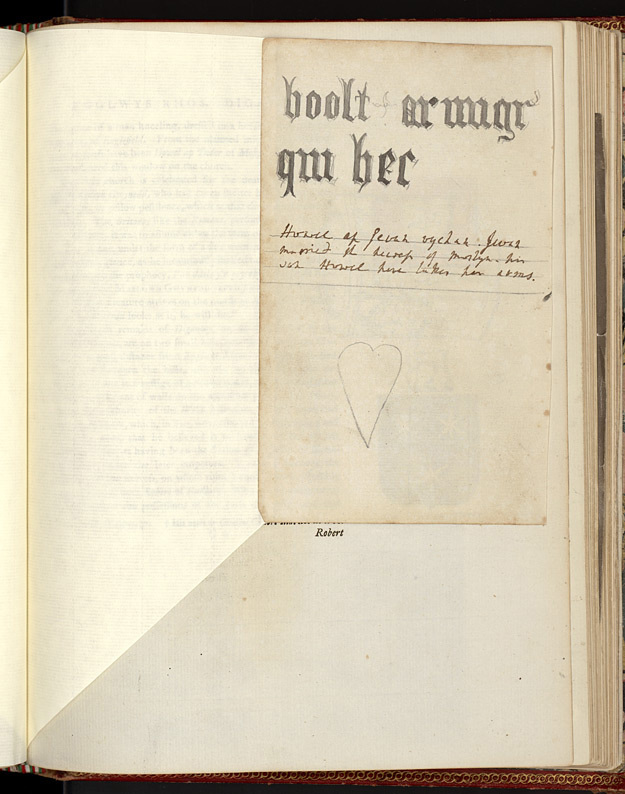 In this instance we have not only the illustration on the page, but an insert, which appears to be an original sketch of the figure, presumably by Moses Griffith. 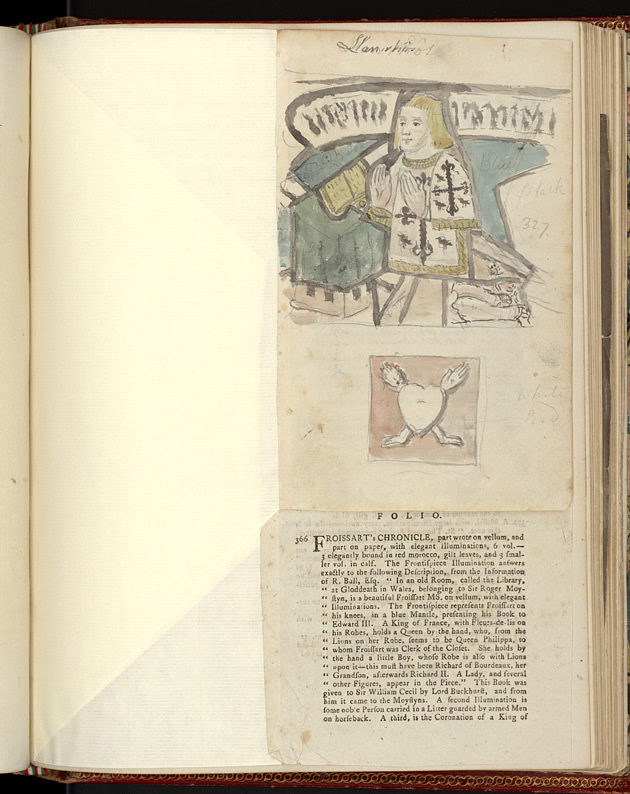 The figure here has a happier demeanor, and only an indication of the inscription, which is recorded separately and also inserted, and was later combined with the figure for the illustration on page 328. Insert from National Library of Wales’ extra-illustrated volume four. 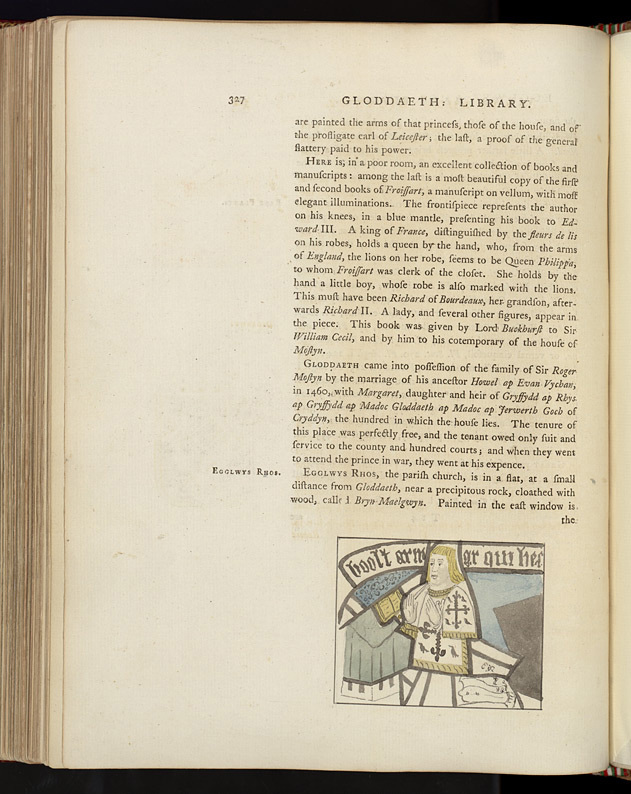 Page from National Library of Wales’ extra-illustrated volume four. The figure is not mentioned in the survey of medieval glass in North Wales by Mostyn Lewis (1970), or in the Royal Commission inventory (1956). So what became of it? 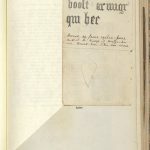 The discovery of the image encouraged me to go and find out. The church is usually locked outside of service times, so I had to arrange a visit with the incumbent. The church is full of stained glass, but there was no sign of the figure. I subsequently identified the lovely Victorian east window as the work of Lavers & Barraud, and there are also nineteenth-century windows by Mayer & Co. and Ward & Hughes, and a more recent window by Celtic Studios. There are also some unusual scenes painted on green glass in the south transept, which look as though they might date to the early nineteenth century, or just possibly earlier. Detail of the east window at the Church of St Eleri and St Mary, Llanrhos. But there was no sign of Howel ap Tudor of Mostyn. 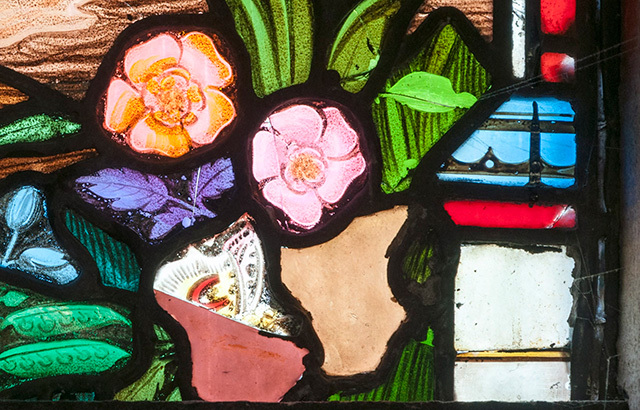 There was, however, an odd piece of glass in the lower part of the central light of the east window, painted and joined, without lead, to a piece of pinkish glass. What is it? Could be old? This entry was posted in Walkers' Blog on 26th August 2016 by Luca Guariento.